Judge Elaine Lu decided to sentence Jasmine “Abdullah” Richards, a Pasadena Black Lives Matter leader, to 90 days in jail and 3 years probation following her persecution by L.A. District Attorney Jackie Lacey and the Pasadena Police Department for attempted lynching. This unjust sentencing has made a mockery of our justice system and sends a chilling message to social justice advocates across the country. We must continue the fight! CLICK HERE to join us in calling for Governor Jerry Brown to pardon Jasmine “Abdullah” Richards' sentence. In a perverse misapplication of a 1933 California law intended to stop lynch mobs from forcibly removing detainees from police custody and engaging in public murders of Black people, Black Lives Matter organizer Jasmine "Abdullah" Richards was convicted of attempted felony "lynching" on June 1, 2016. 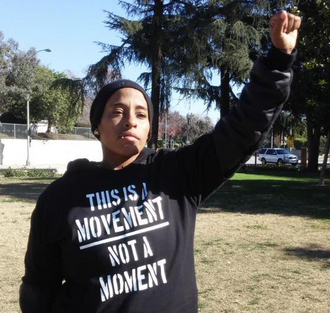 The 29 year-old lead organizer for the Pasadena Black Lives Matter chapter was found guilty of charges related to an attempt to shield a Black woman from what she believed to be unlawful detainment by Pasadena police, following a "Peace March" that she and the chapter organized. While there are no allegations of violence and no injuries suffered, the peaceful gathering of 15-20 children, mothers, and community members was dubbed a "riot" by the prosecutor - a necessary element to the "lynching" charge. Jasmine's story is incredibly inspiring. Growing up in Pasadena, she has said she felt 'lost' until having a political awakening inspired by the Ferguson protests in 2014. Jasmine traveled to Ferguson as part of the 'Black Lives Matter Rides' and returned home feeling the call to fight back against police violence. Unfortunately, her newfound purpose was met with aggressive harassment by law enforcement. Jasmine was repeatedly targeted for arrest and faced exorbitant bail amounts and excessive charges. Now local police and prosecutors have taken the extreme step of convicting Jasmine of felony attempted lynching - labeling her 'Peace March' a riot and comparing Black Lives Matter to the Klu Klux Klan in the process. Judge Elaine Lu presided over the case and is set to sentence Jasmine "Abdullah" Richards on Tuesday, June 7th. Jasmine is currently being held in Los Angeles County jail. The charge could bring as much as 4 years in state prison. Jasmine has been fighting for her community. Please join us in standing with her and demand "No Jail Time for Jasmine." This is the letter we will send to Judge Lu. I am writing you to ask that you not sentence Black Lives Matter activist, Jasmine 'Abdullah' Richards, to any jail time for the preposterous 'attempted lynching' she has been convicted of. As you know, the law that Jasmine was convicted under was created to protect Black people from race-based mob violence at the height of America's lynching epidemic. It is incredibly insulting to Pasadena's Black communities and all people of conscience to use this law to incarcerate a non-violent Black political activist. As a Judge, you are sworn to uphold the constitution including our rights to peaceful assembly and free speech. Regardless, of how you may feel about the cause of police accountability, imprisoning Jasmine for what happened at the Peace March she organized in 2015 would set a dangerous precedent and only exacerbate the lack of confidence Black communities have in the criminal justice system. Please do not allow your courtroom to be used as a tool of intimidation and retaliation. Refuse to sentence Jasmine to jail time.